Last night I played the first hour of Astro Bot on PSVR and now everything is in flux. 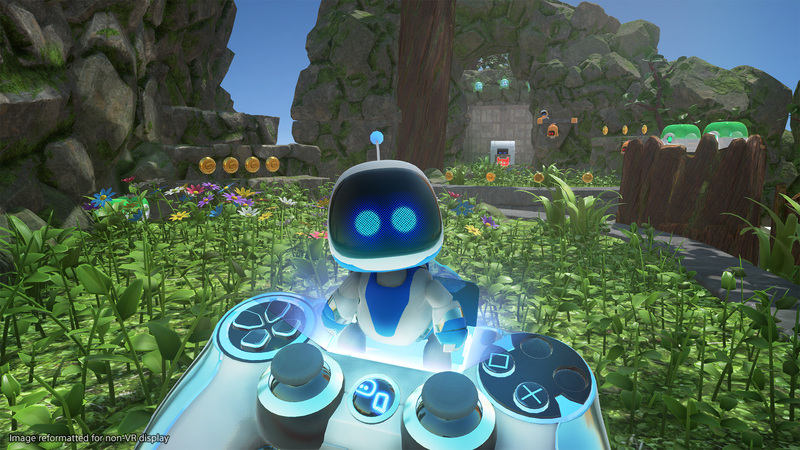 I hadn’t turned on my VR unit for pretty much the whole year, but I’d rented Astro Bot, Tetris and Moss and figured I’d give them each a fair shake before deciding if I should just get rid of the thing. Tetris is basically super-trippy Tetris, which is either your thing or isn’t. (I like Tetris, but I’ve never been particularly good at it, and I’m not sure that VR is the extra kick in the pants that I needed.) And I haven’t even put Moss into the PS4’s disc drive. But Astro Bot…. wow. Even for a relatively simple platformer, it genuinely feels like a new thing, and it’s also just so goddamned cute and charming and delightful. It felt like magic. I finished the first world and was absolutely floored by it. And given that games aren’t often a vehicle for pure joy these days, I am definitely going to need to finish the whole thing before I can fully reconcile the rest of my Games of 2018. And speaking of which, one of the games that gets a substantial write-up in that post would be Assassin’s Creed Odyssey, which I’ve now sunk over 70 hours into and I’m starting to see the finish line off in the distance. I’ve wrapped up 2 of the 4 major campaign storylines, and the other 2 are somewhat tied into each other anyway, and so that’s where I’m spending the rest of my time when I’m not in VR-land. (Or when I’m not playing the hard parts in Super Mario Odyssey for my son.) I would like to see the credits roll before I figure out where to rank it inside the AC franchise; it has so much in common with Origins that it’s hard to think of the two as separate games, and I don’t think I actually made it to the “end” of that one, either. In any event – it’s good! It’s janky and clunky, as AC games tend to be, and it’s really hard to play it without thinking of Red Dead Redemption 2 (and vice versa), but in and of itself it’s quite something. Tara Westover’s mesmerizing “Educated”, which deserved every bit of praise it received. And I’m already 2 books into 2019 – I finished Nova Jacobs’ “The Final Equation of Isaac Severy”, which was pleasant but slight, and Oyinkan Braithwaite’s short and savage “My Sister, the Serial Killer”, and now I’m reading Richard Powers’ “Overstory”, which is just absolutely gorgeous. There is something to be said for escapist fiction – it’s easy, it’s fast, it’s something else to think about for a little while – but there’s also something to be said for reading a real-deal Novel, where the language is more like music than anything else. I’d read a previous novel of his, “Orfeo”, and I appreciated his poetry even if the novel fell a little flat; but “Overstory” feels like a genuine work of beauty. Anyway – this is just to say that the 2018 Games post will be coming eventually, and that in the meantime I’m still here. Hope you’re all doing well.